You just finished taking some pictures of your children making snow angels in really bright, fresh snow. You download the photos from the memory card, and you notice that your child is underexposed and the snow looks gray instead of white. Or while taking some photos of a black Corvette on black asphalt at a car show, the resulting photos are blurry from a long shutter speed and the car appears gray. What is going on here? Why isn’t the snow white and the car black? The camera is trying to think for you. Don’t let machines think for you! Take control – you’re the artist, not the camera. 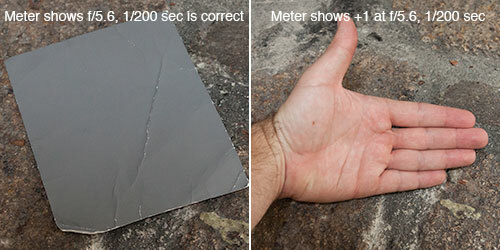 Exposure meters need a common reference point, and this reference point is what’s called “middle gray” or “18% gray” (referring to the percentage of light reflected). This is what the camera thinks is the neutral, normal brightness of the world. It’s a tone halfway between white and black. When you take a photo in any mode but Manual, the camera wants to adjust the exposure to make the tone of your scene equal to middle gray. But that’s not how the world looks! Get your camera and a white piece of paper. Put the camera in any mode but Manual (recommend Aperture or Shutter Priority) and make the paper fill the viewfinder. You’ll notice the exposure meter in the viewfinder should be centered. Take the photo. Now review it. The paper looks gray, doesn’t it? Fortunately we can override this, and we usually need to. If you’re not familiar with your camera’s exposure override controls, usually called “exposure compensation”, I recommend taking a look at the manual before continuing further. You should also be familiar with how your camera meters the light, and the differences between modes such as Spot, Center-Weighted, Partial, and so on (depending on the camera). This is crucial to understanding how the meter operates and which light the camera is looking at, but it’s beyond the scope of this article. You can read up more about it in our Camera Metering Modes Explained article. Ready? Good. Now take that same piece of paper and adjust your exposure compensation to +2 (you read the manual and know where this is now) and take the picture. Looks a little brighter, and a little more normal, doesn’t it? And if you look at your camera’s histogram, the curve should be to the right of the histogram and not centered. This is what we expect because the paper is brighter than a mid-gray tone. This concept should always be in your thoughts when shooting. Always say to yourself “how much brighter or darker is this scene than mid-gray?” So now let’s take a look at some ways we can get the exposures we want. It’s a great idea to carry a gray card with your camera. You can get cheap paper cards from most photographic supply stores and more expensive, durable plastic cards are on the market as well. You can click on the image to the left to follow our sponsored link and purchase this 3 Card Set – 4″ x 5″ White Balance Cards. Our stuff on MyPhotoCentral shoots with them all the time. To use them correctly, it is vital that the card is receiving the same light as your subject. So put the card next to your subject, take a meter reading off the card (say, at f/8 and 1/200 sec the meter is centered), and then remove the card from the scene but keep the same exposure settings. Do this either with Exposure Lock, operate in Manual mode, or adjust the exposure compensation while in Aperture or Shutter priority to match those settings. Leave your gray card at home? You can use the sky on a sunny day for metering. Your average blue sky is nearly the same tonal density as middle gray. If it’s not a bright sunny day, don’t fret, you always have a gray card on hand, so to speak. You can calibrate your hand to the gray card! Take your camera and gray card outside on a sunny day. Put the card in the light and take a reading in Manual mode, using the shutter controls to center the meter. Now move your palm into the viewfinder without adjusting the camera settings. Where is the exposure meter? For my pale white palm it reads +1. So now +1 is my “zero reference point” when metering off of my hand. I’ll put my hand in the same light as my subject, metering the palm of my hand, and adjust the exposure to +1. There is a lot more to this subject, but this is a great place to start. As long as you know what the camera is trying to do and how to override it to match the scene or your vision, you’ll spend a lot less time in post-processing and a lot more time shooting! If you have enjoyed this post and wish to receive updates on any future posts subscribe, like and follow us! This entry was posted by John Peltier.